Blood glucose levels should be monitored before an exercise session to determine whether the person can safely begin exercising, especially someone using insulin or selected glucose-lowering oral agents. The overarching goal in the treatment, control, and management of hypertension is to reduce the risk of CVD morbidity and mortality. Walking exercise is particularly beneficial for helping PAD patients with claudication to improve their walking ability, although all types of exercise are beneficial for general cardiovascular health. 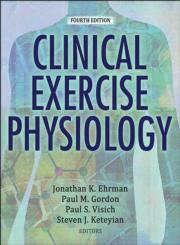 Clinical Exercise Physiology, Fourth Edition With Web Resource, is the most comprehensive guide to the clinical aspects of exercise physiology. Covering 24 chronic conditions, it is the go-to book for students preparing for ACSM Clinical Exercise Physiologist certification. As the profession of clinical exercise physiology continues to evolve, there is one cornerstone text that evolves along with it. Clinical Exercise Physiology, Fourth Edition With Web Resource, has been a mainstay in the field since its inception in 2003, and the revisions and additions to this latest rendition reinforce its elite status. As the most comprehensive resource available, Clinical Exercise Physiology, Fourth Edition, provides greater coverage and depth of diseases than is typically found in most clinical exercise physiology textbooks. It thoroughly examines the effects of exercise on chronic disease and then investigates 24 chronic conditions, covering the scope of each disease as well as the pathophysiology, medications, and clinical applications. It also examines clinical considerations and exercise prescriptions for four special populations. The online case studies are written in the form of SOAP (Subjective, Objective, Assessment, Plan) notes, reflecting common medical chart documentation, to help readers experience realistic examples. The text also offers Practical Application sidebars in each chapter; some of these sidebars focus on exercise prescription, and other Practical Application sidebars review the relevant literature related to physiological adaptations to exercise training. To aid in course preparation, instructors are provided a test package, chapter quizzes, and a presentation package plus image bank. Clinical Exercise Physiology, Fourth Edition, offers a contemporary review of the variety of diseases and conditions that students and professionals may encounter in the field. New and veteran clinical exercise physiologists alike, as well as those preparing for ACSM certification exams, will appreciate the in-depth coverage of the clinical populations that benefit from physical activity and exercise. Text for upper-undergraduate- and graduate-level clinical exercise physiology courses and a study resource for ACSM Clinical Exercise Physiologist certification. Also a reference for clinical exercise physiologists, sports medicine practitioners, exercise and sport science educators, physical therapists, athletic trainers, and physicians interested in treating their patients with exercise. Jonathan K. Ehrman, PhD, FACSM, is the associate program director of preventive cardiology and director of the weight management program at Henry Ford Hospital in Detroit. He has a 33-year background in clinical exercise physiology and is certified by ACSM as aclinical exercise physiologist and as a program director. He previously served as the chair of the clinical exercise physiologist credentialing committee for ACSM. Dr. Ehrman is author of more than 200 manuscripts and abstracts as well as several text books and chapters. He is an associate editor of the most recent edition (10th) of ACSM’s Guidelines for Exercise Testing and Prescription. He was also the senior editor of the sixth edition of ACSM's Resource Manual for Guidelines for Exercise Testing and Prescription. He is a fellow of the American College of Sports Medicine and the American Association of Cardiovascular and Pulmonary Rehabilitation and a member the American Heart Association and the American College of Cardiology. Dr. Ehrman earned his PhD in clinical exercise physiology from The Ohio State University. Paul M. Gordon, PhD, MPH, FACSM, is a professor and chair of the department of health, human performance, and recreation at Baylor University. He is certified by the ACSM as a clinical exercise physiologist and has over 20 years of experience teaching clinical exercise physiology curricula and directing cardiopulmonary rehabilitation programs. Dr. Gordon has published more than 200 papers and abstracts and several chapters, including in ACSM’s Guidelines for Exercise Testing and Prescription. He has also served as an examiner and coordinator for ACSM certification and credentialing. Dr. Gordon is a fellow of the American College of Sports Medicine, the Obesity Society, and the Centers for Disease Control Physical Activity Research Program. He is an international member of the Royal Society for Medicine. He earned his PhD in exercise physiology and an MPH in epidemiology from the University of Pittsburgh. Paul S. Visich, PhD, MPH, has nearly 20 years of experience in clinical exercise physiology and is the director of the Human Performance Laboratory in the College of Health Professions at Central Michigan University. He worked for 12 years in a clinical setting that included cardiac and pulmonary rehabilitation and primary disease prevention. His research interests involve the assessment of cardiovascular disease risk factors in children, the influence of resistance training in elderly populations, and altitude physiology. Dr. Visich is a member of ACSM’s exercise physiology credentialing committee and previous chair of their professional education committee. He is the author of more than 70 published scientific articles and abstracts. He earned a PhD in exercise physiology and an MPH in epidemiology from the University of Pittsburgh. Steven J. Keteyian, PhD, FACSM, has more than 35 years of experience working as a clinical exercise physiologist. He is program director of preventive cardiology at the Henry Ford Hospital in Detroit. Over the course of his career, Dr. Keteyian has focused on exercise and physical activity in both healthy individuals and those with chronic diseases. He is the author of more than 100 scientific articles and book chapters as well as four textbooks. Dr. Keteyian is a member of the American Associatioon of Cardiovascular and Pulmonary Rehabilitation and the American Heart Association. He is a fellow of the American College of Sports Medicine. He earned his PhD from Wayne State University in Detroit. All ancillaries are free to course adopters and available at www.HumanKinetics.com/ClinicalExercisePhysiology. Test package. Contains more than 570 true-or-false and multiple-choice questions. Chapter quizzes. Include 10 to 16 multiple-choice and true-or-false questions per chapter. These ready-made quizzes are compatible with learning management systems to test student understanding. Presentation package plus image bank. Includes more than 850 PowerPoint slides of text, artwork, and tables from the book that can be used for class discussion and presentation. The slides in the presentation package can be used directly within PowerPoint or printed to make transparencies or handouts for distribution to students. Instructors can easily add, modify, and rearrange the order of the slides. The companion image bank includes most of the figures, content photos, and tables from the text, sorted by chapter. These can be used in developing a customized presentation based on specific course requirements. Web resource. Features more than 40 case studies that depict real-life scenarios and include discussion questions. Sample answers are provided to instructors for convenient grading.